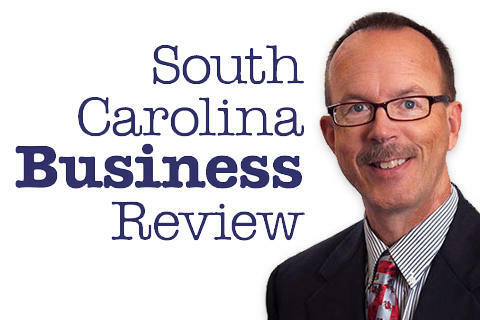 The South Carolina Business Review, with host Mike Switzer, focuses on news from South Carolina's business community with interviews of many small business owners and business leaders from around the state. South Carolina's nonprofits, including its colleges and universities are also regularly featured on the program, as well as many of the state's small business support organizations. DISCLAIMER: The views and opinions expressed on The South Carolina Business Review are their own and are not necessarily those of South Carolina Public Radio. While the national unemployment rate recently dropped to a new post-recession low, South Carolina's keeps inching in the other direction. What's with that? Mike Switzer interviews Joey von Nessen, a research economist with the University of South Carolina's Moore School of Business, and their Division of Research, which stays busy tracking and calculating our state's economic statistics. A weekly update of the news, events and issues facing South Carolina's business community. Mike Switzer interviews John Warner founder and CEO of Innoventure, and its Swampfox business news service, based in Greenville, S.C. Events: Internet of Things, 2014 South Carolina Business and Research Mission to Israel. If you are a small business owner, how excited are you when you have to go talk to a banker about financing your business needs? Probably not so much. Our next guest is running a web-based company that he says is helping lead a revolution in small business finance by reducing the complexities found in the traditional lending process. Mike Switzer interviews Hunter Stunzi, co-founder and president of Snapcap based in Charleston, SC. Most writers will acknowledge that the odds are against their dream of becoming successfully published authors. Traditional publishers and literary agents reject most of the manuscripts sent to them, and authors who self-publish typically meet with unflattering results as well. Our next guest says the biggest reason for this is that too many authors do not take the extra step of having their manuscripts professionally edited. Most college students know they can sell their used textbooks back to the college bookstore but what about their used bookbag or any other item they don't want anymore? eBay? Craiglist? Our next guest recently won a pitch competition for what he says is a better idea: an online marketplace allowing university students, professors, and staff to buy and sell these items between themselves. As a result, he won a year of free space at the USC Columbia Technology Incubator. Autumn is a time of tradition and ritual: the World Series, a new school year, apple cider, and the fall harvest. For those in the financial services industry, fall is time to check in on the U.S. economy, the Federal Reserve, and the financial markets as investors begin their year-end planning. Mike Switzer interviews Wes Johnson, a Certified Financial Planner with Carolinas Retirement Specialists in Charleston, who is going to give us his autumn update. Mike Switzer interviews Alan Cooper, founder and editor of three online business news websites in South Carolina: MidlandsBiz, UpstateBizSC, and LowCountryBizSC. In case you hadn't heard, the American Planning Association recently announced that South Carolina is home to one of their 10 Great Streets in America. That street is King Street in Charleston. Mike Switzer interviews Tim Keane, planning director for the City of Charleston, SC. In 2009, with the great recession setting in and business drying up, our next guest, a real estate developer at the time, started looking for a new way to utilize his sales talents. Soon after, he visited his alma mater, Florida State University, where he kept hearing from students about how taxis were expensive, parking in town was non-existent and DUIs scared everybody. So he scribbled on a cocktail napkin: “Green Operated Transportation Carrying Humanity Around”. And his new company was born. No, it's not Uber or Lyft. There's a new international movement in the business community that is seeking to inspire business owners to elevate not only their profits but humanity as well. Our next guest recently received approval to launch a chapter of this non-profit organization in the LowCountry. Mike Switzer interviews Barry Patterson, president of the Charleston chapter of Conscious Capitalism. Most of you are probably familiar with the several forms a business can take: sole proprietorship, partnership, limited liability company (LLC) and a corporation, further subdivided as a traditional C-corp or S-corp. But our next guest has formed a relatively new type of corporation, the B-corp. which focuses not only on profits but “benefits” to the community or environment. Mike Switzer interviews Deb Stirling, chief financial officer for Infinite Habitat, based in Columbia, SC. Homelessness continues to be a concern to cities and businesses across South Carolina. Our next guest runs the state's largest homeless shelter and service provider, which recently re-branded itself to reflect what it really provides its clients: a chance to turn their lives around. Mike Switzer interviews Stacy Denaux, CEO of One-Eighty Place in Charleston. We've been hearing some talk lately that one of our state's newest MBA programs has apparently hit its stride with students and employers alike. So we thought we'd look into it. Mike Switzer interviews Jim Kindley, director of the College of Charleston's MBA program, now in it's fifth year. Human fertility clinics have a lot more tools in their trade these days that are not only resulting in happier customers, but a healthier bottom line as well. Mike Switzer interviews Dr. Michael Slowey, a reproductive endocrinologist with Coastal Fertility Specialists in Mt. Pleasant. Have You Run Your “Fiscal Fire Drill”? In many households, one person manages the family finances. But if something happens to that fiscally knowledgeable family member, does anyone else know how to access the financial information? Our next guest says that whether you are single or part of a family, you need to run what she calls a "FISCAL Fire Drill". Mike Switzer interviews Catherine Latto, a certified financial planner with Latto and Associates in Charleston. A weekly update of the news, events and issues facing South Carolina's business community.Mike Switzer interviews John Warner founder and CEO of Innoventure, and its Swampfox business news service, based in Greenville, S.C.
Do Your Salespeople Have the Right Attitude? There are a lot of factors that can affect the overall performance of a business, but one thing is for sure: If you don't have sales, you don't have a business. Mike Switzer interviews Bill McCrary, founder and CEO of Sandler Training South Carolina, a franchisee of Sandler Training, the national organization recently named the number one training company in America by Entrepreneur Magazine. Does Your Company Incentive Plan Deliver Results? It's fairly standard practice these days for companies of all sizes to offer their employees performance incentives as part of their compensation. Our next guest however, says he sees companies across our state and the country wasting millions of dollars on incentive plans and bonus systems that don't deliver the desired results. Mike Switzer interviews John Carroll, president of Unlimited Performance based in Mt. Pleasant, SC. Robot Assistance or Robot Invasion? What is a Register Investment Advisor? These days, investors have quite a variety of firms to choose from to help them manage their money. Financial planning firms, banks, mutual fund companies, insurance companies, trust companies, investment management firms...it can sometimes be difficult to determine just who to choose. Has Our Economic Recovery Run Out of Steam? Recent economic statistics, such as the unemployment rate and housing starts, seem to be moving in the wrong direction. Has the recovery finally run out of steam? Mike Switzer interviews Joey von Nessen a research economist with the University of South Carolina's Moore School of Business, and their Division of Research, which stays busy tracking and calculating our state's economic statistics. You often hear us talk about the importance of STEM education in our state's schools and how it relates to what's happening in today's business world. But recently the arts have been added to that equation of science, technology, engineering, and math, creating a new moniker, known as STEAM. Our next guest believes that without the arts, a child's career stem may not bloom to it's full potential. Mike Switzer interviews Former First Lady of S.C., Rachel Hodges, Chair of the Board for the Governor's School for the Arts Foundation. The end of the year will be here before you know it and our next guest says that that means you probably should start thinking about tax planning. Are there things you could do now to minimize your tax bite in the spring? Mike Switzer interviews Andy Owens, managing editor of SCBizNews, the company that publishes the Columbia Regional Business Report, Charleston Regional Business Journal, GSA Business and SCBizNews magazine. best performing and fastest growing companies for three years in a row. You would probably agree that estate planning is not one of your favorite topics but our next guest says that understanding how your assets are owned and how they will transfer is key to making sure your wishes are fulfilled after your death. Mike Switzer interviews Bethany Griffith, a certified financial planner with Abacus Planning Group in Columbia. Mike Switzer interviews John Warner founder and CEO of Innoventure, and its Swampfox business news service, based in Greenville, S.C. There has been a lot of talk and concern in recent years about “patent trolls” – entities that own patents and threaten infringement lawsuits to obtain license fees, but which do not actually make products using the patents they own. And although federal legislation has been introduced to address this problem, Congress has not been able to agree on the details. Recently however, the U.S. Supreme Court unanimously decided a handful of patent cases that could have a substantial impact on patent trolls without that legislation.